Purchased jointly with the National Galleries of Scotland, with the assistance of the National Heritage Memorial Fund, John Paul Getty II, Baron Heinrich Thyssen-Bornemisza, Art Fund, and numerous donations from members of the public. This marble figure group was made for the Sculpture Gallery at Woburn Abbey, Bedfordshire, and was originally housed in a specially designed Temple of the Graces. 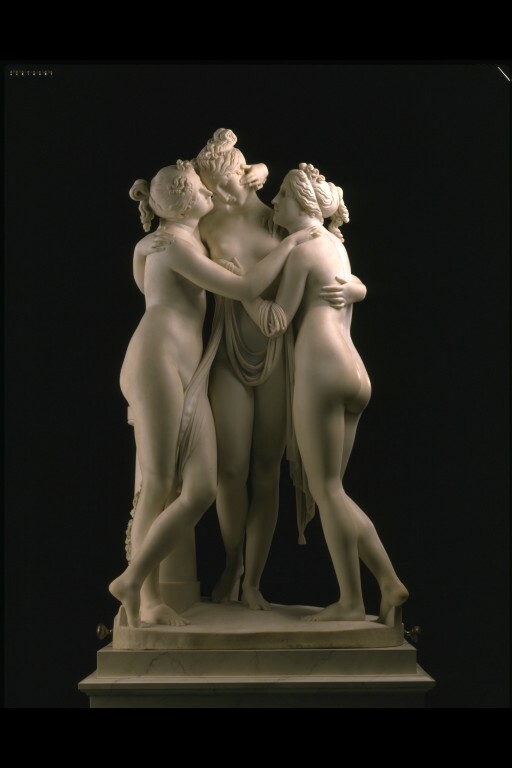 It was commissioned from Antonio Canova (1757-1822) by John Russell, 6th Duke of Bedford, who visited the sculptor in his studio in Rome in 1814, and was captivated by the group of the Three Graces which Canova had carved for the Empress Josephine, the estranged wife of Napoleon Bonaparte. She had died in May of that year, and the Duke offered to buy the group from Canova, but Josephine's son claimed it, and that version is now in the Hermitage, St Petersburg. The Duke commissioned a second version from Canova; this was begun in 1814, finished in 1817, and installed at Woburn in 1819. It cost 6,000 zechinni, equivalent to £3000. Canova came over to England to supervise the installation. In the Temple it was displayed on a pedestal adapted from an earlier marble plinth, with a rotating top. 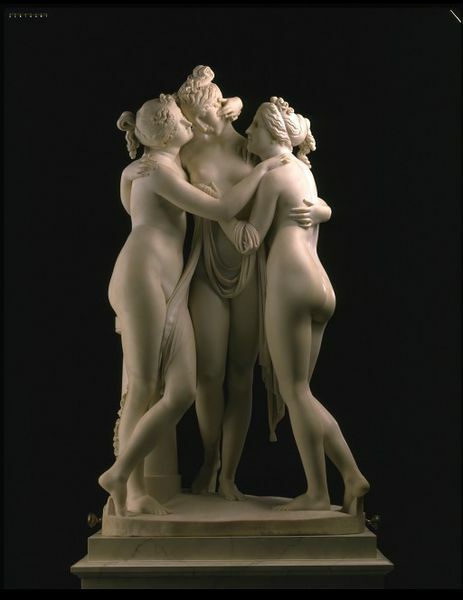 The Three Graces, celebrated in classical literature and art, were the daughters of Jupiter (or Zeus in Greek mythology), and companions to the Muses. Thalia (youth and beauty) is accompanied by Euphrosyne (mirth), and Aglaia (elegance). 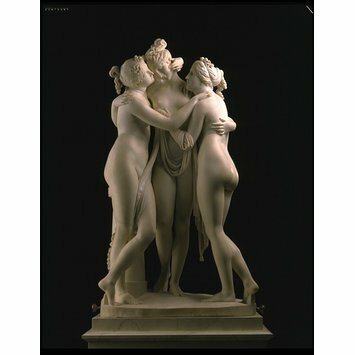 Canova had first depicted the Graces in a painting of 1799, and other drawings and a relief of the subject are also known to have been executed by him at around the same time. In 1810 he modelled a terracotta sketch (Musée de Lyon, France), and in 1812 the Empress Josephine ordered a full-size marble. Canova was responsible for the original design of the group, but his assistants would roughly block out the marble. The sculptor himself completed the final carving, and ensured the surface of the stone was finished in such a way as to suggest the soft flesh of the figures and the harmonious relationships between the three heads, for example. The slightly earlier version, now in St Petersburg and similarly supervised by the sculptor though differing in some details, exhibits a high quality of carving. Copies were made in marble during the 19th century after the sculptor's death; these however do not exhibit the same sensitive handling of the marble. The women embrace each other, naked except for a swathe of drapery hanging between them, and looped over the arm of the Grace on the right. A circular pedestal adorned with a garland of flowers and ribbons stands behind the Grace on the left. Bought from the Fine Arts Investment and Display Ltd. Provenance: Commissioned from the artist in Rome by John, 6th Duke of Bedford in 1814. Completed and placed in the Temple of the Graces, Woburn Abbey, Bedfordshire by 1819. Thence by descent until sold to Fine Arts Investment and Display Ltd in 1985.